The concept of the green man stretches back to antiquity, and is usually depicted as a head covered in leaves and foliage. 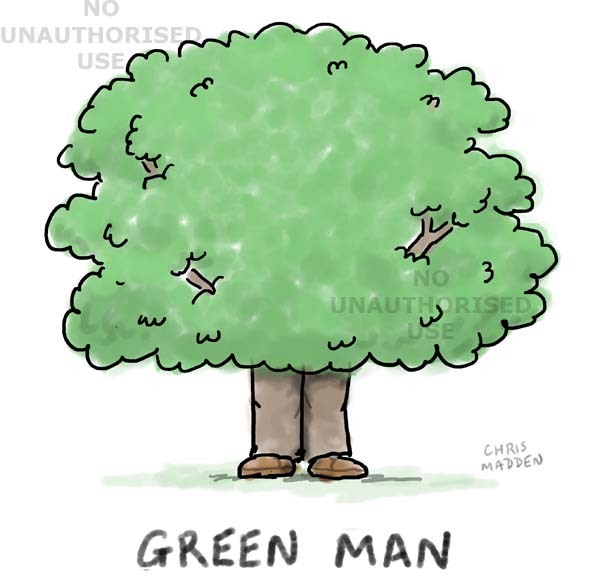 In this cartoon version, the green man is depicted as a tree, where the only evidence of a human link is the man’s legs protruding below the tree’s foliage and forming the tree trunk. St Peter is pointing out to the atheist that there is a notice on the Pearly Gates declaring “No atheists”. 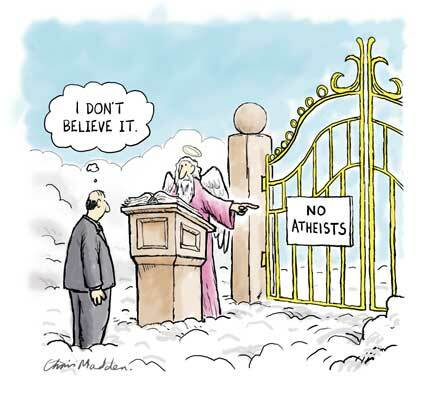 The joke is a play on the fact that the atheist doesn’t believe in heaven rather than that he is exasperated by the fact that he isn’t allowed in. 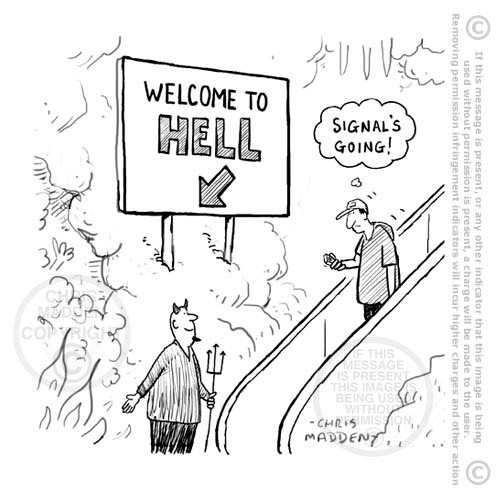 This cartoon isn’t meant to imply that women are saints and men are devils – just that there are definite gender differences between male and female and that women generally come out as being nicer than men. 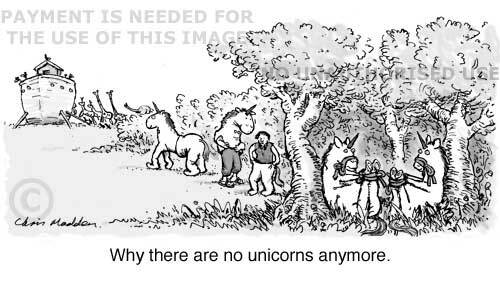 There are biological reasons for that of course. 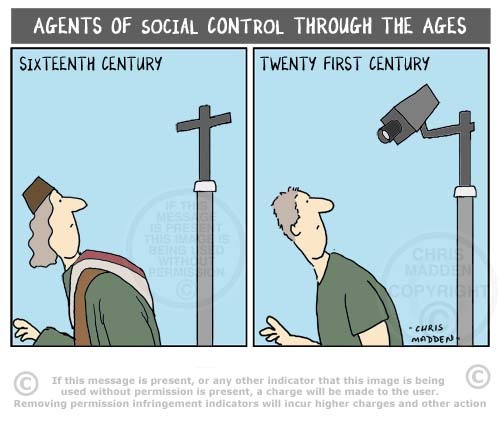 In medieval times social control was imposed by the church and religion. 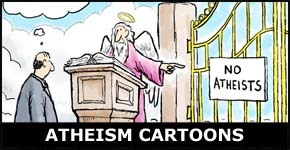 To see my cartoons about atheists and atheism please click the image on the right, or click atheism cartoons here. 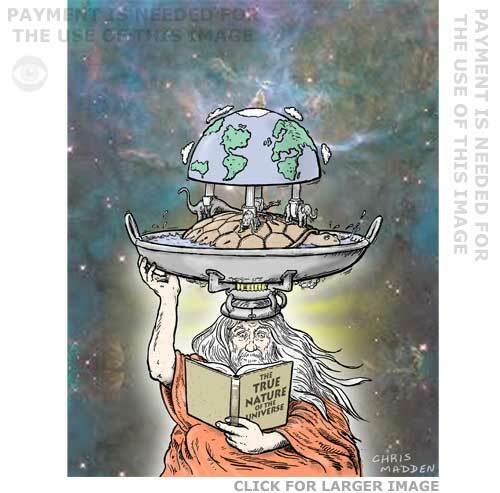 This cartoon illustrated the way that some religious groups think that all necessary knowledge can be found in their holy book. A cartoon showing two figures who look like pieces fro a jigsaw puzzle. This is an atmospheric drawing of a small person between two overwhelming and threatening forms. This drawing is mostly a sketch drawn with a ballpoint pen. It’s been added to in Photoshop, especially in the sky. This is a picture of the concept of God as an old man with a beard, in the sky. 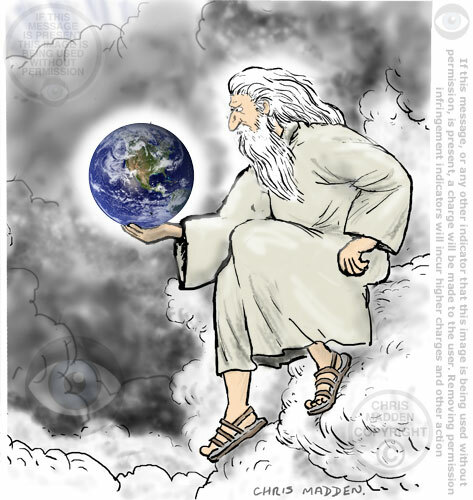 In this illustration God is sitting on a cloud holding the earth in the palm of his hand. 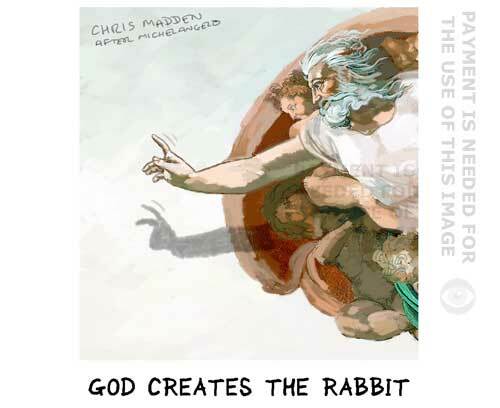 I’m assuming that he’s just created the world, as described in the book of Genesis in the Old Testament. This looks very much like the Old Testament God to me. He even looks a bit displeased with his creation. 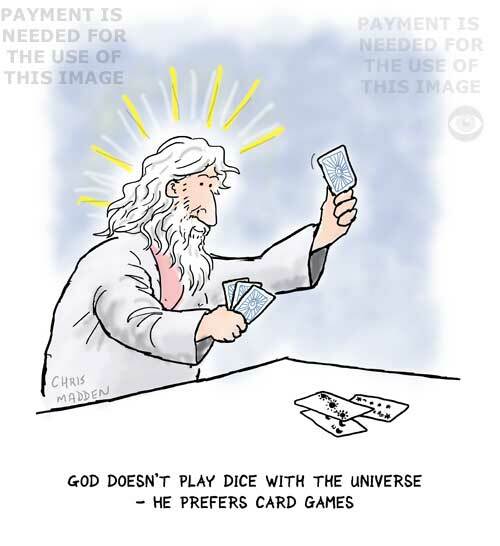 I’m not a believer in God myself by the way. I view God as a myth. 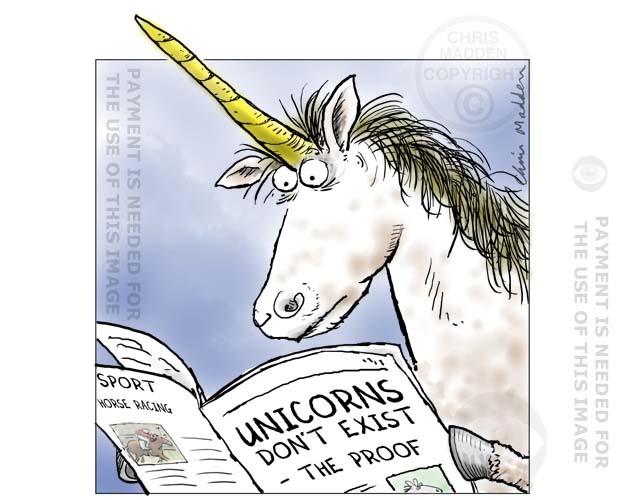 Nothing wrong with myths though! 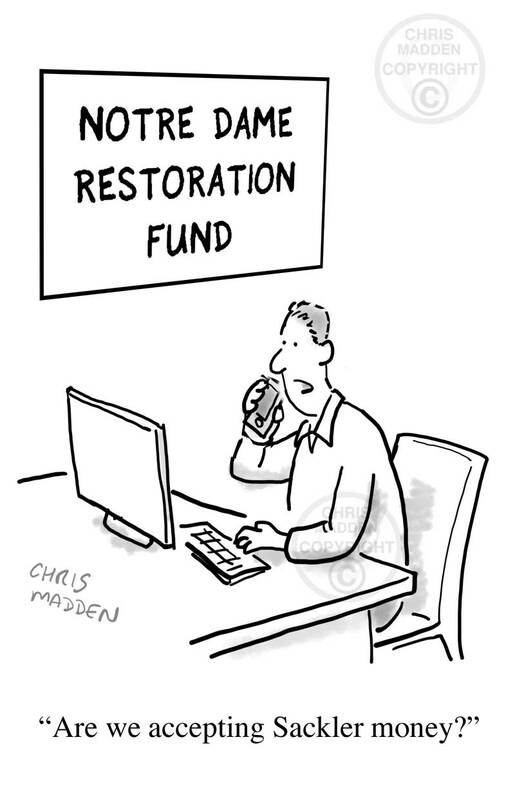 One of a series of “Mrs Walton, life coach and spiritual adviser” cartoons. A joke about the current fashion for so called life coaches and spiritual advisers. Here the life coach is just an ordinary, stereotypical middle aged housewife rather than an authoritative guru-like figure. 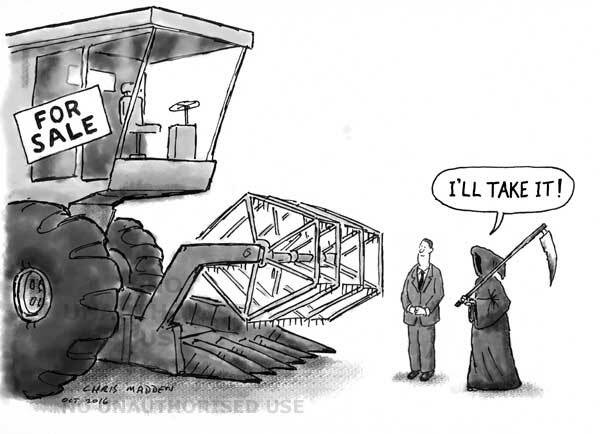 The caption of the cartoon reads “Just because there’s a bridge doesn’t mean you have to cross it”. 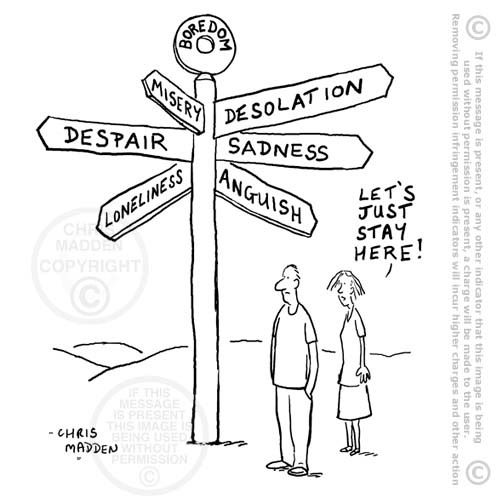 Its meaning is that you shouldn’t necessarily take the route that seems the most obvious or the most natural. Bridges are routes across obstacles, but if the obstacle isn’t actually in your way, don’t follow the urge to cross it (without asking why you need to). 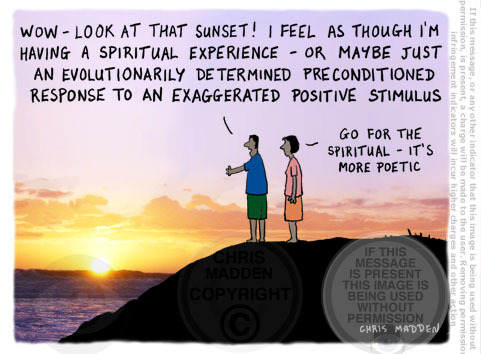 The cartoon is partly about the way that spiritual gurus and similar people often dress mundane and obvious common sense observations up as pseudospiritual and pseudo-profound utterances. However the sayings are sometimes true (as here). Illustration of an eye with a tiny person inside it looking out. A homunculus? 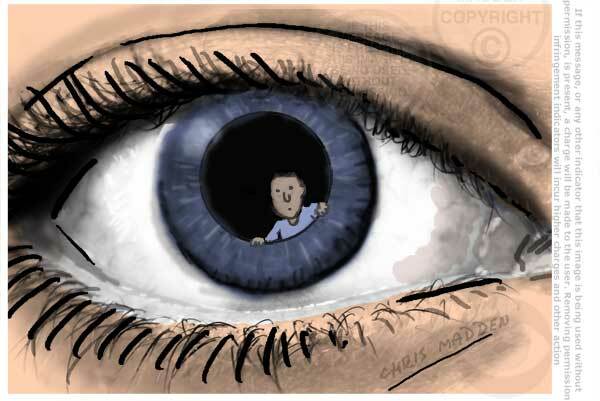 Illustration: looking through someone else’s eyes. In this image the eye is a window with someone looking out through it. It may have something to do with the saying “The eyes are the windows to the soul”. Or maybe not. It’s as though there’s a tiny person living inside the person’s eye, or maybe inside their head. 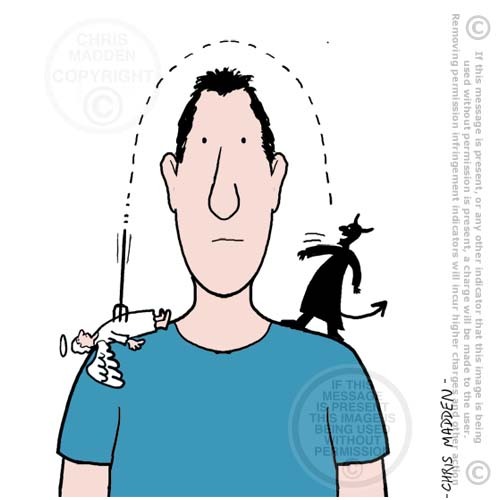 This is related to the homunculus argument (homunculus: Latin for “little man”), which is a philosophical concept that imagines that there is a tiny person inside the head monitoring the activity of the person whose head it’s in. Homunculus arguments are used in psychology and the philosophy of mind to detect where theories of mind fail or are incomplete, usually betrayed by the recursive nature of the concept under examination (where a problem isn’t resolved but is simply repeated art one step removed, as in “Who’s watching the watcher?” or “Is there a homunculus inside the head of a homunculus?”. An illustration illustrating the face of death, symbolised by a skull, peeking round the edge of someone’s thoughts, because it’s always there somewhere, making its presence known. 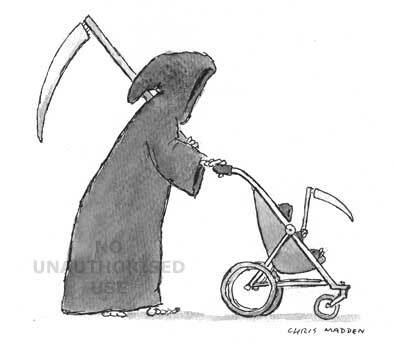 A cartoon about mortality, intimations of mortality, mid-life crisis, life and death, existence, lifespan, philosophy, the grim reaper, awareness of death. Cartoon showing a lifestyle guru explaining the secret of happiness. 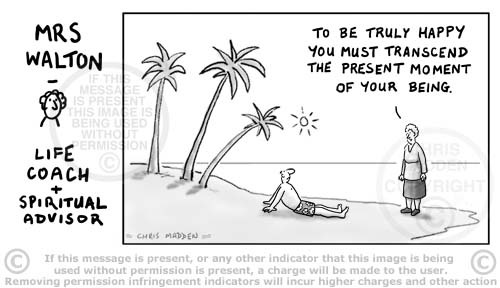 Cartoon showing someone being told by a ‘lifestyle guru’ that to be truly contented you must transcend the present moment of your being. The joke is that the person who is being given this advice is obviously in a very good place right now, and transcending his present moment of being is probably the last thing that he’d want to do. This cartoon is part of a series about the phenomenon of gurus, personal counsellors, lifestyle coaches (a recent and rather ludicrous twist on the phenomenon of personal fulfilment), motivational speakers and suchlike. In the series the guru, counsellor or what-have-you is a very ordinary middle aged woman rather than someone who is removed from the humdrum of everyday life. The speaker is meant to represent to some extent a parody of lifestyle advisers and self improvement gurus, especially those who have a pseudo-spiritual twist to their advise (commonly of a pseudo buddhist inclination). 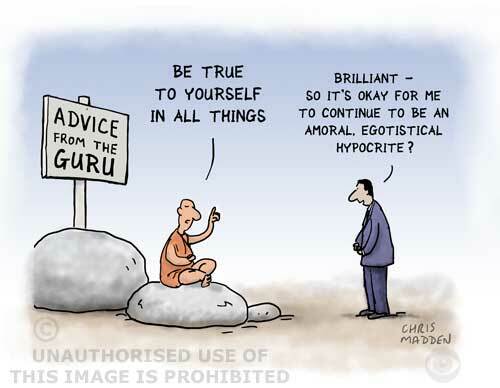 Cartoon about philosophy, lifestyle, lifestyle coaching, gurus, motivational speakers, therapy, counselling, charlatanism, self delusion, aspiration, buddhism. Cartoon. The Tibetan Book of the Dead Funny. Mystical teachings on how to laugh in the face of death. 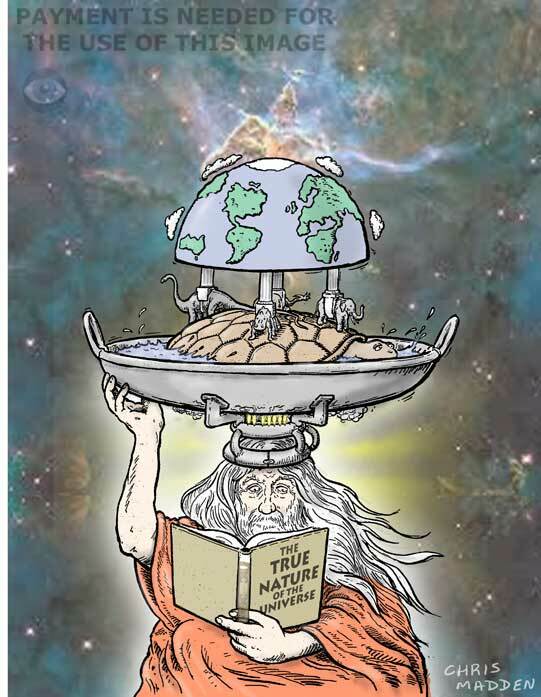 The cartoon shows “The Tibetan Book of the Dead Funny”. Subtitled “Mystical teachings on how to laugh in the face of death”. Cartoon about religious evangelism – trying to convert people to a religion by making special introductory offers. 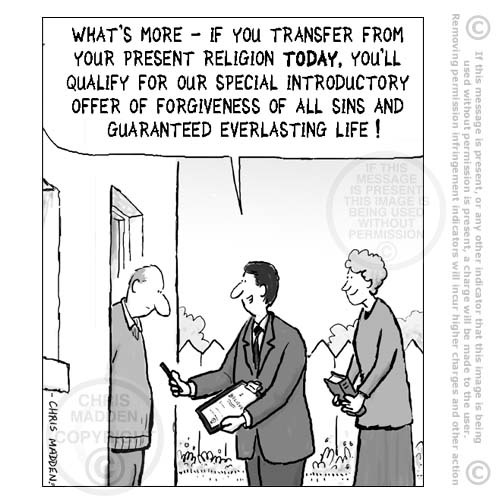 Cartoon – evangelists trying to convert people to a religion by making special introductory offers – eternal life, forgiveness of sins and so on. For more on my thoughts on religion, philosophy and related matters, see my book on the subject. 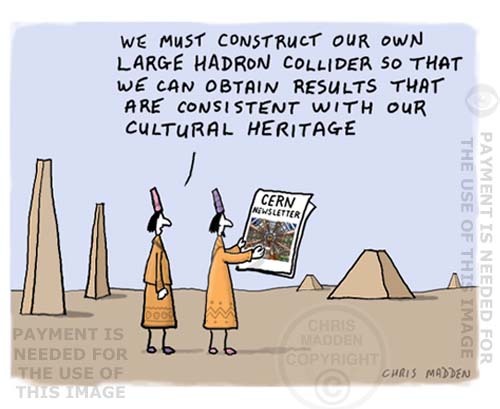 Cartoon about religious conversion, door-knocking religions, incentives for religion, missionaries, religions saving people’s souls, religious pragmatism. 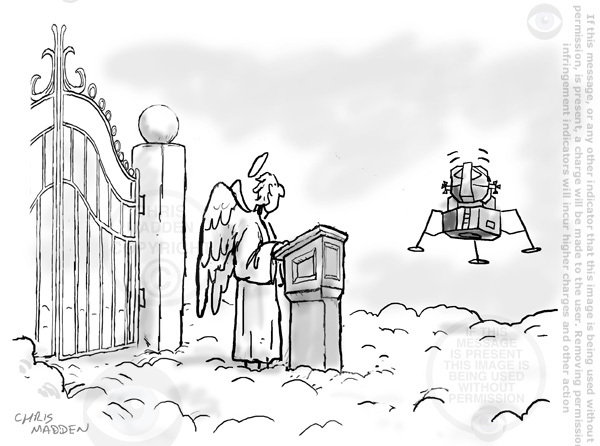 Cartoon about the passage of life. 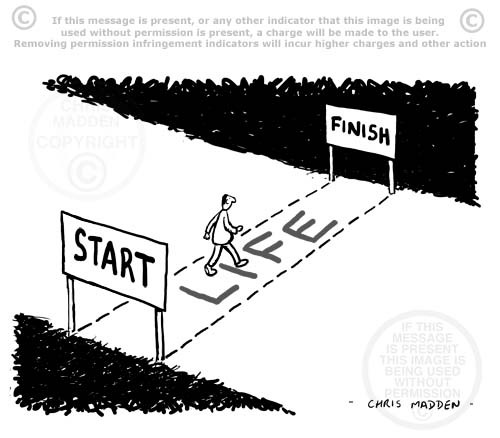 Mortality cartoon – a person walking along a track that represents ‘life’ – with a starting point and an end. 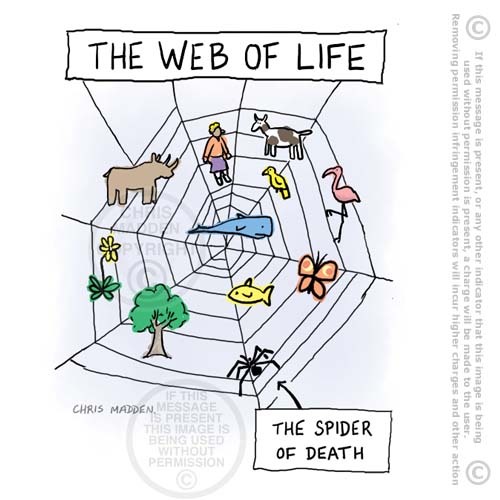 The point of this cartoon is that it illustrates an individual life as a short event that is surrounded by a void – it has ’emptiness’ surrounding it (before it started and after it ends). I’ve deliberately depicted the course of the person’s life as nothing more than a track similar to a race track for a short running race. This emphasises the brevity of life, as seen in some ways. The track is also totally lacking in features, as if nothing is achieved during the life of the person. This is a deliberate over exaggeration, used here to depict only one possible ‘mood’ about the nature of existence. It also emphasises the vast space at ether end of life. This rather depressing view of existence isn’t my own personal view – it’s just one of many possible views (See the cartoon of the person sunbathing in an hourglass for an alternative). Cartoon about intimations of mortality, existentialism, mid life crisis, existentialist crisis, death, meaning of life, purpose of life, life’s brief candle, philosophy, the fearful void. 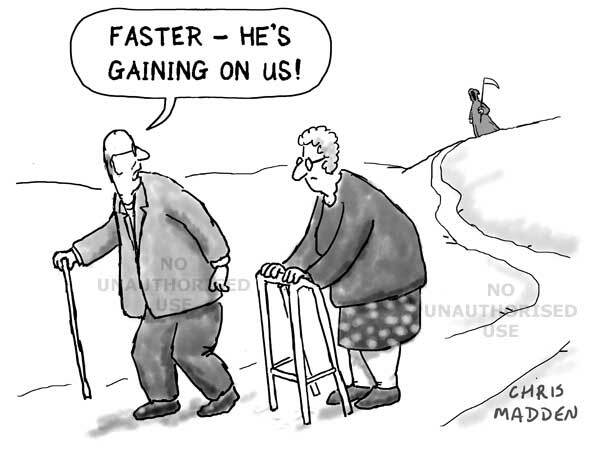 Cartoon about the passage of time and its implications on our view of life. 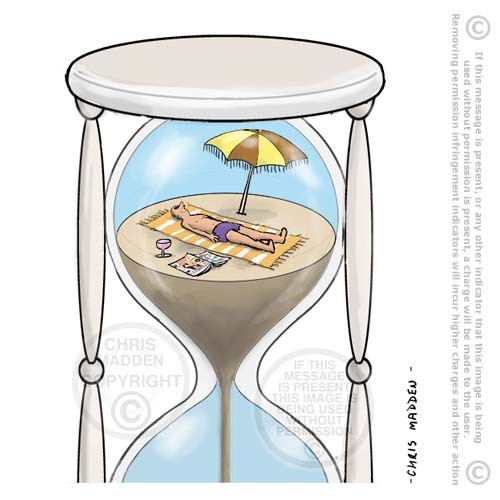 Mortality cartoon – a person sunbathing by lying on the sand in an hourglass – as the sand trickles away. The person in the cartoon doesn’t seem to mind the fact that time is running out, otherwise he’d perhaps try to block the hole in the hourglass rather than just lie on the sand. Or is he unaware of what’s happening? It’s all very ambiguous, which it should be. Cartoon about time running out, intimations of mortality, existentialism, zen, mid life crisis, existentialist crisis (or lack of), death, meaning of life, purpose of life, hedonism, philosophy. Cartoon about morality and ethics. A man with an angel on one shoulder and a devil on the other. The devil in the cartoon has thrown his trident and killed the angel. A variation on the idea that the devil has all the best tunes. A cartoon about the battle between good and evil, philosophy.